Nearly 70% of all disasters occurring in the world are related to hydro-meteorological and the flooding related disasters affect the most to the people, accordingly to the World Meteorological Organization. Most common reasons of flooding are, excessive rain when rivers overflow their banks, the damages dam, rapid ice melting in the mountains that cause the disastrous effect on the land that’s normally dry, while coastal area flooding occurs when a large storm or tsunami causes the ocean to surge inland. Flood forecast and warning help in people’s preparedness for averting likely damage of life and properties due to the actual arrival of the flood. The researchers have invented many devices in past that act as an Early Warning System (EWS), and its evolution started around 2 to 3 decades ago, early 1970s and 1980s to tackle droughts in the West African region. Subsequently, EWS is been used in many areas as a critical solution to save lives and eco-system. Now, Nguyen Huynh Nhat Thuong, a student of the Da Nang University of Technology, Vietnam has invented an early warning system to alert floods after yearlong efforts and creativity, and his invention won the first prize at the 2016 Science and Technology Student competition, reports Vietnamnet. How does his innovative system work? The warning system consists of three components – rainfall measuring stations (located 10 kilometres from each other), a server and radio station, placed near any major waterway or body of water, gives the critical data that will help people to get an early sign of flood and saves their lives. It measures rainfall in the hillside areas and transmits the information to the server before floods actual arrival. Using the radio frequency, the rainfall measuring stations will be connected to a network and one station is situated in the GPRS (General Packet Radio Service) coverage. The ‘bridge in space’ telecommunication technology used to send or receive information and the data from other stations transmitted to the server. The warning system sends a text message (SMS) to the manager as well as displays a message on the website, in case rainfall exceeds the allowable limit. It helps people to response quickly against the natural calamities by evacuating from these flood locations, saving their life and properties. The loudspeaker system will also broadcast a warning message to other parts of the flood area. An attractive features of this device - it is a solar powered solution and the radio frequency enabled rainfall measuring stations can be placed in areas where there are no 2G/3G/4G waves. 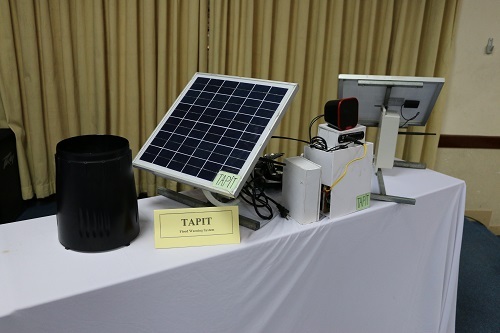 He plans to test this solar powered early warning system in the Vu Gia – Thu Bon Rivers of Quang Nam province with the help of his school and some agencies. Congrats Nguyen Huynh Nhat Thuong for his truly commendable invention, that has many appeals, such as social, renewable energy and eco-friendly technology!